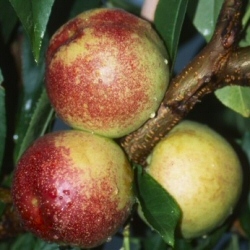 Fertility: Lord Napier is a self-fertile nectarine, therefore only one tree is required for pollination to provide fruit. Lord Napier is supplied in a 7 or 12 litre container which means it can be planted at any time of year, not forgetting that regular watering is a pre-requisite especially in dry and warm/hot weather. Although the 7 and 12 Litre Lord Napier Nectarine trees are the same age, the 12 litre are generally taller and thicker than the 7 Litre Nectarine. Once the trees have reached maturity, any difference between the two will hardly be noticeable to "normal people". The Nectarine Police raiding your garden with CSI Lord Napier in tow maybe able to tell you what size pot it was delivered in. Our nectarine trees are grown in the UK so they are well-suited to UK climatic conditions. All our Nectarine trees are delivered in containers offering the advantage of you being able to plant ALL YEAR ROUND. By leaving them in the container or pot outside over winter (October to March) you run the risk of killing them unless you put them in a heated conservatory or greenhouse. We advise planting as soon as you receive them unless there is a frost.